The march ‘He Lives’ was followed by a Euphonium and Cornet duet, ‘The Prayer’, played by Adrian Horwood and Chris Boughton. Following Ray Steadman-Allen’s ‘Air Varie – The Praising Heart’, featuring ‘Come let us all unite to sing; God is Love!’ Adrian returned to play ‘I’ll Walk with God’. Three of the younger members of the Band, Rebecca Abbott, Louise Robinson and Martin Davis, played the classic cornet trio ‘The Veterans’, before ‘Gabriel’s Oboe’ from the film ‘The Mission’ and the song setting ‘Sing Hosanna!’ were presented. ‘Intrada – Thank You’ and William Himes’ ‘Soli Deo Gloria’ opened the second half of the programme, before Martin Davis sang Sara Groves’ song ‘He’s Always Been Faithful’, accompanied by Carole Horwood on the piano, featuring the well-loved hymn ‘Great is Thy Faithfulness’. 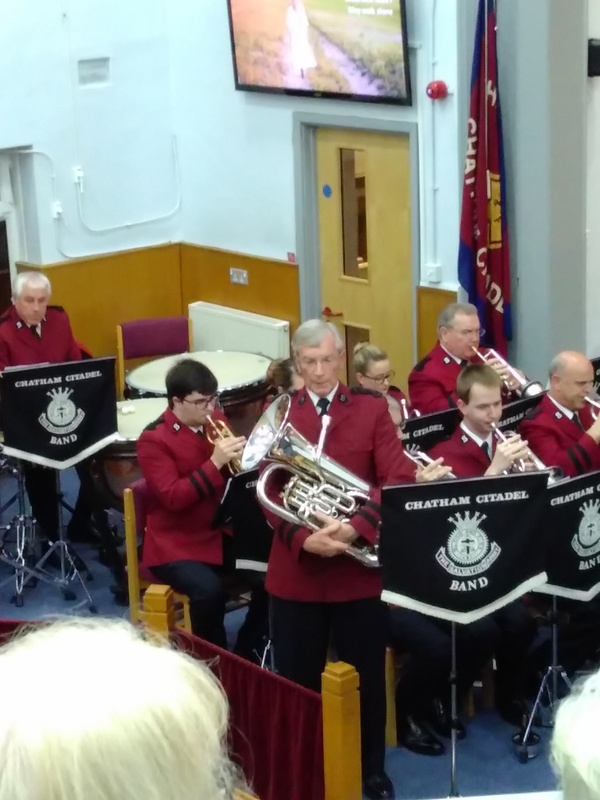 The Band followed this with a sensitive rendition of John Stainer’s ‘God So Loved the World’, before Major Ian reflected on the truths found in John 3:16 and that, regardless of our past or our current circumstances, God’s love extends to us all. The evening ended on a lively note with ‘Exuberance’ and ‘Fill the World With Glory!’. 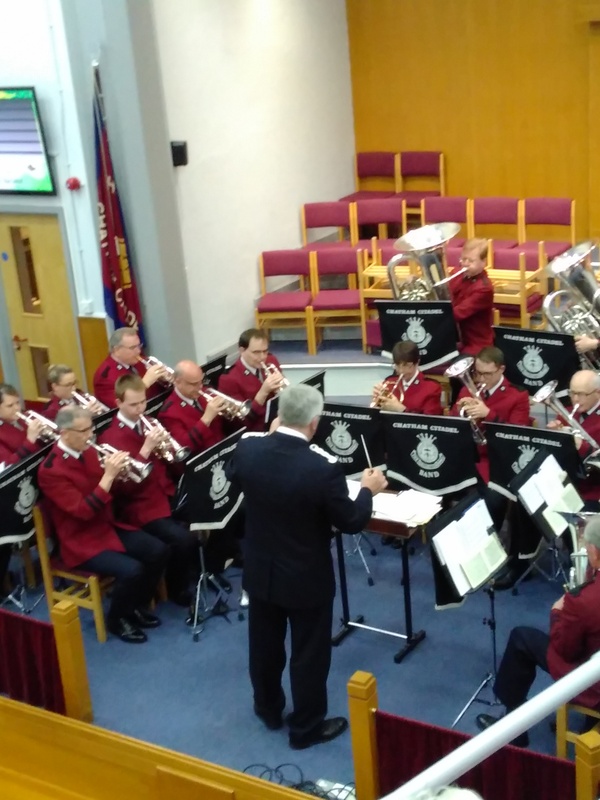 We continue to be grateful for the gift of music – for those who write music and words for us to reflect on and for those who give their time to make music a regular part of our worship at the Corps. On Sunday, our morning meeting marked the Salvation Army’s International Day of Prayer for Children and Youth, coinciding with Mother’s Day. Major Ian introduced our theme; ‘Dream big, pray like a child’ and at several points we stopped to pray for children in different settings. The meeting opened with the song ‘Our God Reigns’, before the lively ‘I’m Gonna Jump Up and Down’. Five young people from the Beavers were then invited to the platform, where they were presented with the ‘Corps Officer’s Badge’. 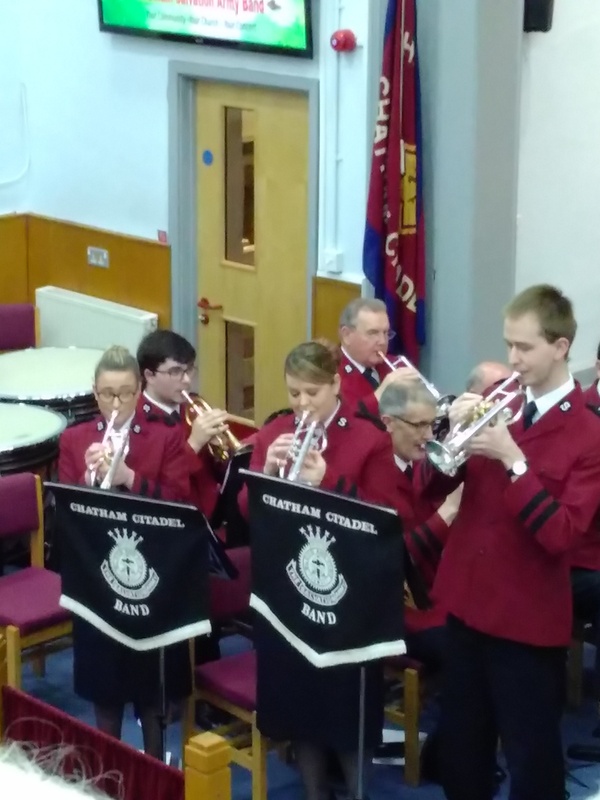 The Young People’s Band followed this with the toe-tapping march ‘Trinity Praise’, featuring the tunes ‘Father, we love you’ and ‘Regent Square’. Nicola Forrest, headteacher of the New Road School, joined Major Ian on the platform to talk about the after-school club which members of the Corps run each Monday. Nicola spoke of some of the challenges at the school, at which some 34 languages are spoken by the children, but said that the work of the school is all done within an ethos of promoting honesty, responsibility, consideration and respect. 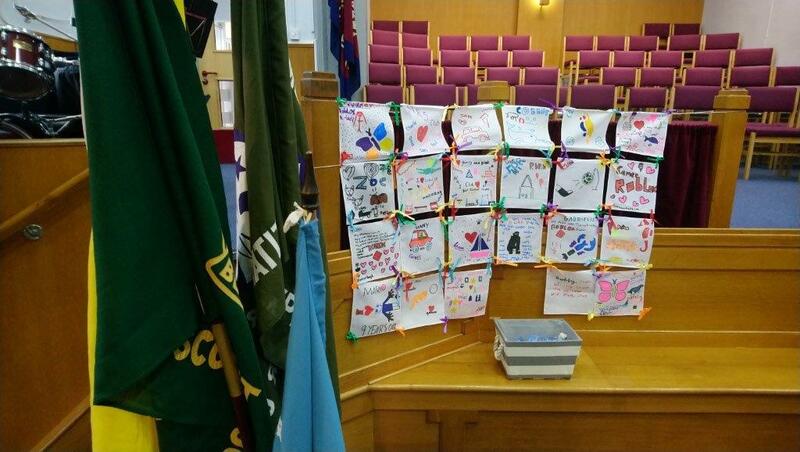 The front of the hall was decorated with drawings by the children at the New Road School club and we prayed for the ongoing work which takes place there. The Singing Company adapted Stevie Wonder’s hit to ‘Isn’t she lovely… she’s my mum!’ before the congregation joined to sing ‘Come and Celebrate’ while bunches of daffodils were given to all of the ladies in the congregation. In his thought, Major Ian considered people in the past who have dreamed big dreams – which then became true. If Nehemiah had not ‘dreamed big’ despite the challenges facing him, he would not have succeeded in rebuilding Jerusalem. Similarly, if William Booth had not had a dream about preaching to the needy in the East End of London, the Salvation Army may not be preaching the gospel all around the world today. We were encouraged to consider what our dreams are and what God is saying to us, so we too might achieve incredible things in his name. The meeting finished with the children’s songs ‘Wonderful Lord’ and ‘It’s the way it’s gonna be’. The second meeting of the day was a ‘Reflection on the Psalms’ led by Major Ian. It was a time when we thought about the structure of the Book of Psalms by watching a video ‘Read Scripture: Psalms’ which was very helpful in our understanding of this section of the Bible. How there are Psalms of Lament and Psalms of Praise which are good for us to use as guidance. Many Psalms have been set to music and we listened to a vocal rendition of Psalm 8 by Keith Evans. Psalm 18:1-3 and Psalm 17 (Msg) were used as prayer. People expressed their favourite Psalms with reasons why. They included Psalm 23 and Psalm 121. Psalm 37:3-5, 39-40 were especially meaningful when praying for the situation in the Far East. Psalm 100 sung by the Songsters was very moving to Estelle and Peter coming back to England from a place where there was no singing/music. Psalm 150 was one often chosen by children in Singing Company as it referred to music. Psalm 23 was read and sung to a modern setting. Psalm 51 was mentioned as a Psalm of the second chance ‘Create in me a clean heart O Lord, and renew a right spirit within me’. Major Ian mentioned that his mother had told him to read this Psalm the day he had given his heart to the Lord. We sang the old chorus ‘Thank you Lord for saving my soul’ which expresses the restorative love of God. We watched a film of Torri Kelly singing a modern version of Psalm 42 before more favourite Psalms and verses were shared. We listened to David Suchet reading Psalm 150 and a vocal presentation of ‘Bow the Knee’. The afternoon ended with the singing of the Gaelic blessing. This was a time of rich blessing through scripture. Next week, we look forward to ‘Preparing for Easter’ at 10am and an interesting afternoon ‘On the sofa’ with Tim and Heather Scott at 4pm.